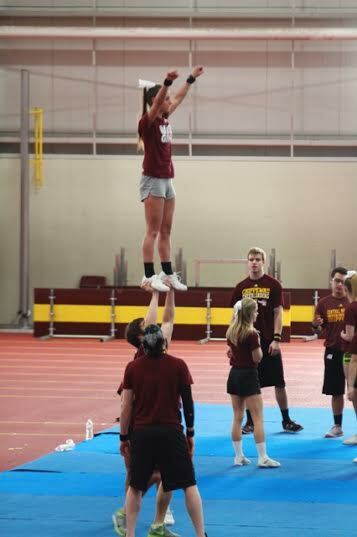 Hannah Burgess during cheerleading tryouts at Central Michigan University. The Everest Collegiate High School cheerleaders not only have bragging rights for their many awards in the school trophy case, but now they have one of their own selected for a nationally competitive college squad. After an intense three-day try-out, senior Hannah Burgess is now officially a cheerleader at Central Michigan University for the coming school year. Everest cheerleading coach Nancy Burgess (Hannah’s Mom) was very proud. “She beat out girls from a number of D1 programs including Clarkston,” she said. Hannah’s accomplishment is especially impressive, Nancy said, since Hannah has been recovering from a significant injury to her arm that kept her from competing on the Everest squad for her junior year. → A New Tradition Begins – Everest Monthly Missions!